The tutorial below explains the process step by step. It assumes that you already know how to flash a ROM. In order to proceed, you will need to be running the Dirty Unicorns ROM, and will need several applications from the Play Store: Nova Launcher, GMD Gesture Control Lite, Wave Launcher, Invisible active Widget, FontFix, Boot Animations, and Roundr. This has been tested successfully with and without Multirom on the Nexus 4 and without Multirom on the LG G2. MAKE A BACKUP and then flash the Dirty Unicorns ROM (and a set of GAPPS, if you want them – if you don’t, you’ll have to find alternate methods of downloading apps). Note: first boot can take a very long time. Be patient. You need Dirty Unicorns specifically, because it has the Fling navigation bar, which you will use to create the gesture area. Check the supported devices section at http://dirtyunicorns.com/ to find out if they support your device. Downloads are available at the site as well, but it’s a good idea to check out the XDA thread for Dirty Unicorns on your device. The thread for the Nexus 4 is here: http://forum.xda-developers.com/nexus-4/orig-development/rom-dirty-unicorns-mako-edition-t3326301. After installing the ROM, proceed through the initial device set up and log into your Google account for Play Store access. Install GMD Gesture Control Lite. Click me to download a pretty nice webOS icon set Alan put together. Get the webOS icons and wallpaper you need. You can harvest them from a webOS device or doctor. There’s a good discussion at http://forums.webosnation.com/webos-discussion-lounge/325891-default-icon-location.html and there are more icons in the app folders in /media/cryptofs/apps/usr/palm/applications/. Alternatively, you can find the icons online. See http://webos-ports.org/wiki/Graphics_Work and http://www.veryicon.com/icons/system/palm/. I found the launcher up-arrow icon in this set: http://flamemo.deviantart.com/art/Palm-web-OS-icons-122466330. The white line for the gesture area is here: http://imgur.com/a/sE5QS. Or click the icon box on the right to download a pre-built set. Put the icon images and wallpaper in the “pictures” folder on your device. While you’re harvesting icons and wallpapers go ahead and grab two Prelude fonts from /usr/share/fonts: Prelude-Medium and Prelude-MediumOblique. Get the stock webOS wallpapers or super awesome Just type… wallpapers for Step 11 below. Press the arrow in the top left to return to settings. Select Display > Wallpaper > Gallery and navigate to the folder in which you saved your wallpaper. Agree with permissions dialogs if any appear. Press “Set wallpaper” at the top left of the screen. Back out of settings to the home screen and push the home button to start Nova Launcher. Enter the app drawer. Select the GMD Gestures App. Select the “Home” gesture (the top one). Select “4 Touch Points” and change it to “1”. Press Okay. Select “Advanced Options” and make sure that “Active On Keyboard” is toggled on. Hit the arrow in the top left to go back one screen. Press the check mark in the top right of the screen to save your changes. Press and hold “Back” and select “Remove.” Repeat for all other actions (except “Home”). Set the Border Size to 10mm. Reduce the Gesture Size Adjustment to somewhere around -30. Ensure “Start on Boot” is toggled on. Under “Gesture Vibration,” you might want to slide the slider all the way to the left to get rid of the haptic feedback. Go to Settings > Dirty Tweaks > Navigation > Navigation Bar. Select “Custom logo image” and navigate to the folder where you placed the white line image for the gesture area. Enter the app drawer. Select Nova Settings > Look & feel. Toggle off the “Transparent notification bar” setting. If you long press (press and hold) and then drag the icons on the dock, you can rearrange them. Move the app drawer icon to the far right. It may try to combine with another app icon and create a folder. Just keep moving it around until the other icons slide over to make room. If you long press the icons, a menu will appear. Long press the app drawer icon. Select edit. Tap the icon to the left of the App label. Select “Gallery apps.” Choose “Gallery.” Navigate to folder where you placed the up-arrow launcher icon for the app drawer. Press “Done.” Press “Done” again. Long press and remove any unwanted app shortcuts from the dock. Long press and remove unwanted app shortcuts from the desktop. Wait to add any new shortcuts to the dock until later (step 19). Enter the app drawer and select Nova Settings > Dock > Dock Background. Under “Content” choose “Tint.” Select the blue-grey color (top row, second from left). Set the “Transparency” slider to around 70%. Enter the app drawer. Long press and drag to “Edit” at the top right any app you wish to change the icon for. Select “Gallery apps.” Choose “Gallery.” Navigate to folder where you placed the icon. Press “Done.” Edit the App label if necessary. Press “Done” again. Repeat for each icon you wish to alter. When you have finished editing the icons in the app drawer, long press and drag to the dock any icon you want on the dock. Enter the app drawer. Select Nova Settings > App & widget drawers. Set the “Transparency” slider to 7%. Backswipe in the gesture area to exit. To mimic webOS’ 3×4 icon grid on the Pre3 tap Drawer App Grid and set it there. You’ll notice the apps seem pretty far apart. 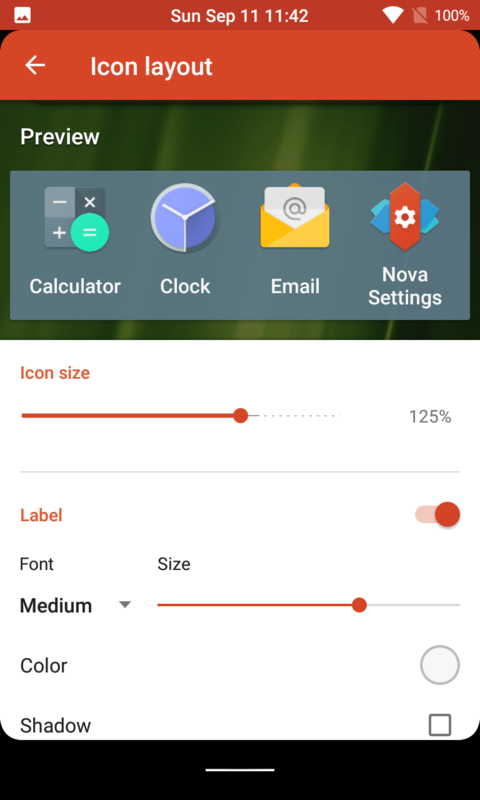 Feel free to play with icon size and font size in Icon Layout in Nova settings. The images below in Step 13 show my setup of 125% icon size and Medium font size with the slider at about 60% to the right and white text color. Feel free to play with it. Enter the app drawer. Go to Nova Settings > Desktop. Toggle off “Persistent search bar” if necessary. Enter the app drawer. Go to Settings > Sound & notification > Other sounds. Toggle off “Touch sounds” and “Vibrate on touch” if desired. Make sure to tap Gallery or your selection won’t save. Open Wave Launcher. Back swipe. Ensure that the boxes for “Enable on startup” and “Soft keyboard has precedence” are both checked. Select “Number of apps.” Set to five (or the number of shortcuts you have in the dock). Scroll down and de-select “Auto advance on edit.” Back swipe to return to the main setup screen. Select “Calibrate.” Set the size and location of the launch trigger (shown in pinkish red). I set mine to the bottom left, so that it’s unlikely to be accidentally triggered. Back swipe to return to the main setup screen. Tap the double image icon to save on the top left. Select “Edit wave.” Select the apps for each position. I mirrored my dock apps, so that it is most like webOS. After you have chosen an app, you can long press the icon on the wave launcher to bring up a menu and change the icon to match the customized icons on the launcher. Make sure to use Gallery and tap the double image icon on the top left to save. If you want the app tray shortcut in the far right position, when you’re adding that shortcut, select the up-right arrow to the right of the android robot. 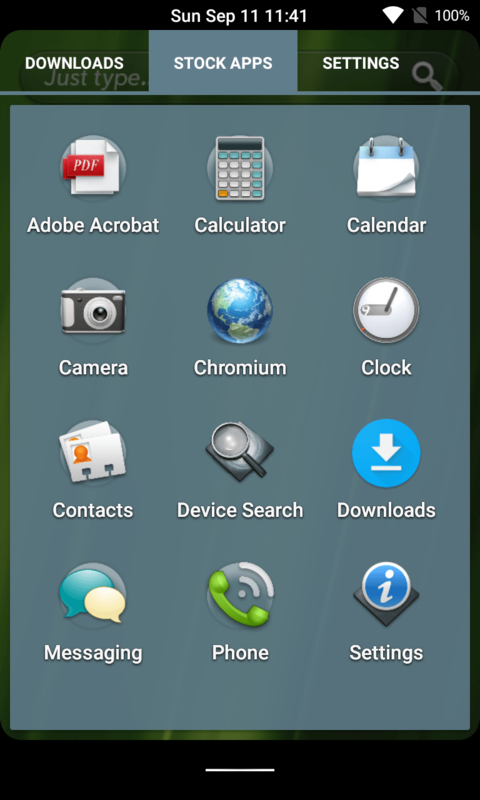 Scroll down through the list and select “Nova Action” and then “App drawer.” Long press the icon on the wave bar and proceed to change the icon to the webOS launcher icon. Back swipe to return to the main setup screen. At this point, you may want to change the wave launcher transparency to match that of the dock. If so, select “Edit Colors” and adjust the slider marked “A” to your preferred setting. You might have to toggle “Enable Roundr” off and on to get the app to start the first time. Ensure that “Start on boot” is checked. Set the corner radius. Using my Pre3 as a guide, I set the corner radius at 18 on my LG G2, but different screen dimensions may call for a different setting. Back swipe to exit the app. Long press on your homescreen and tap Widgets. Tap and hold on “Invisibles active Widge.. 2 x 1” and drag it to the top left corner of your homescreen. (Toggle the checkbox and tap Create if prompted from Nova Launcher). Tap and hold on the dark numbered box on your homescreen and tap Resize in the pop-up that appears. Drag the right side of the box as far right as it lets you. Tap outside of the box anywhere on your homescreen and then tap the dark box you made to open Invisible active Widgets. You’ll see your Widget ID and below that “Launch app”. Tap “Launch app”. From here you can select your favorite search app. Google or BlackBerry Device search are obvious choices. (If you don’t have the BlackBerry Manager app which comes with the entire suite of BlackBerry Android apps…you’re missing out). Once you’ve selected your search app, toggle Config Mode to off and tap OK. You can now select the area your Just type bar is in to launch the app! Scroll down and select “Drawer groups” to create tab sections. After you create the groups, select each group, and use the check boxes to choose which apps to assign to the group/tab. You can also assign individual apps to tabs from the app drawer. Just enter the app drawer and long press and drag app icons to “Edit” at the top. You can assign the app to a particular group/tab in the edit dialog. Tap the underlined “here” word to change which system font to replace. Copy Prelude-Medium and Prelude-MediumOblique to your device and remember where you put them. Tap the folder icon and browse to where you saved the fonts. Tap Prelude-Medium and tap Select. On the next screen you’ll see a preview of the font. Tap +. A warning pop-up appears. For the first font only all you have to do here is tap INSTALL because it defaults to the primary font Android uses. It will ask you to reboot. You can tap not now if you want and continue to the other two. Choose Roboto Medium and tap INSTALL. Again reboot or not, up to you. Repeat steps 2-4. On step 5 choose Prelude-MediumOblique then continue on and tap Here again on the warning pop-up. Scroll and choose Roboto Italic and tap INSTALL. This time reboot. See some before and after pics below. Go to Settings > Sound & notification > Default phone ringtone and select a ringtone. Your newly added ringtones should appear in the list. If they don’t, you may need to reboot your device to repopulate the list. Go to Settings > Sound & notification > Default notification ringtone and select a notification sound. You can also do app specific sounds as you see fit within each app. This is simply an example. You can change any system sound you want to change using the procedure below. I wanted to add the sound that webOS makes when you plug in the USB charger. After installation, launch Amaze file manager. Press the hamburger menu in the top left corner. Select settings. Scroll to the bottom of the settings screen and toggle on “Root Explorer.” This allows you to modify system files. If you navigate to /system/media/audio/ you’ll find four sound folders. The ‘ui’ folder contains many of the system sounds. Using Amaze, I copied the webOS sound file ‘notification.wav’ to /system/media/audio/ui. To move the file use the following procedure. When you’re in the folder with notification.wav, press and hold the file, and then press the double-box icon to the left of the trash can to copy it. Go to /system/media/audio/ui and press the clipboard icon to paste the file into the folder. Press and hold the file WirelessChargingStarted.ogg, select the three-dot menu in the top right, and press rename. Rename the file something like WirelessChargingStarted_old.ogg so that you still have a copy later. The WirelessChargingStarted.ogg file is the sound file played when you connect a USB charger (go figure). It doesn’t matter that the palm notification file that you renamed is not really an ogg file. Android will use it anyways. Press the hamburger menu in the top left corner of the Amaze file manager. Select settings. Scroll to the bottom of the settings screen and toggle off “Root Explorer” so that you don’t modify system files by accident later. If you’re a visual learner, see this video: https://www.youtube.com/watch?v=iEie6mbcDGM Note that the names of the files he is changing in the video are outdated, but his procedure was the basis for the one described here. Nothing against the big unicorn but wouldn’t you rather have an HP or Palm logo pulsing as you boot your device into webOS-droid? The files below are at the Nexus 4’s resolution of 768×1280. Download either the Palm animation or the HP animation. Copy the zip file to your device and remember where you put it. Swipe up to open the app launcher and open Boot Animations. Tap Install from local storage. Find the zip file and tap on it once to highlight it. You can preview it here if you want but if you’re ready, tap the big + button. Grant Boot Animations root access. Feel free to create a backup or uncheck it if you don’t care. There are alternative, customizable task-switchers in Settings > Dirty Tweaks > Multi-Tasking > Recents. Unfortunately, neither provides a webOS-style card interface. Rather, they display running apps in a slide-out pane. I found that both the “OmniSwitch” and “slim recents” task switchers caused unwanted interference with the webOS-style gestures, but you may have better luck. If you discover a webOS-style card-based Android task switcher, you are obligated to report it in the forums at webOS Nation! Tada! Happy modding! Jump in to ask questions to Shuswap or comment in general in the thread on the Forums.